The RAV4 remains at or near the top of the pack no matter how you look at it. The compact CUV started with the first RAV4 Toyota produced in the mid-1990s. Today, Toyota is still a dominant force in this space despite some serious competition from basically every single major automaker out there. While there are some seriously nice rides from Toyota's competition, the RAV4 remains at or near the top of the pack no matter how you look at it. It's simply a solid vehicle that sells very well. Essentially, it won't cause your pulse to quicken, but it gets the job done. Toyota's hybrid version of its venerable CUV adds yet another layer to the RAV4's rich offerings, and we were excited to take this little crossover for a week-long spin. Here's what we found out about the latest iteration of the vehicle that started the crossover craze. Driving Impressions The first thing you notice about the RAV4 is that it makes you feel confident on the road. No matter the situation the CUV makes you feel like you're in total control. Driving down the highway? Simple. Crunching up a gravel road? Piece of cake. Race a Dodge Challenger? Okay, not that one. But in everyday driving situations, the RAV4 makes you feel like king of the castle -- albeit an affordable castle. The adaptive cruise control and other driver assist technology means there's actually little real driving you have to do. It's easy to steer and controls are all within reach and intuitive. The RAV4's biggest accomplishment is also its biggest downfall. The thing is downright boring to drive, especially on the highway where you can set the cruise, forget it and get lost in the music you've cranked up on the stereo. While this may sound wonderful, after a few days in the car we found ourselves longing for something a little more involved. Still, many people would be happy with this kind of vehicle indefinitely. Ride Quality: Not too soft or hard, with only the biggest bumps doing much to disrupt the RAV4's path down the road. Steering: Numb but still pretty responsive and well weighted at any speed. Acceleration: The RAV4 is no race car, but as far as boring hybrids go, it's reasonably quick. You'll have no issue keeping up with traffic. Braking: The brakes are progressive and powerful. They're not grabby or stiff at all. Handling: This thing is no canyon carver, but it corners pretty flat and allows you to turn confidently. Technology & Safety The RAV4 Hybrid we drove came decked out with tons of technology, including blind-spot monitoring with rear cross traffic alert, front and rear parking sonar, a pre-collision system with pedestrian sensing, steering assist, dynamic radar cruise control and much more. As far as infotainment goes, the system is relatively easy to use, and we liked the ability to split the screen into two views so we could see the navigation map and audio simultaneously. Infotainment Screen Size/Quality: The 7-inch screen feels like the right size for the dash, but in split screen mode it seems small. The resolution could use some improvement. You can see everything but it is a little fuzzy. Bluetooth Phone Pairing: Seamless pairing via Bluetooth and no issues reconnecting upon entry to the vehicle. Voice/Sound Quality: Call quality was good and both sides had no issues hearing the other. 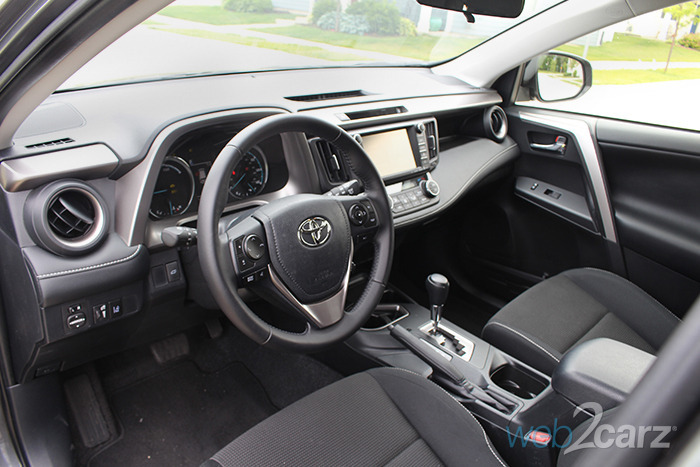 Controls: The RAV4's infotainment controls are primarily accessed through the touchscreen, with buttons on either side to aid navigation. While it works well, there are better systems out there. Safety: Stability control, traction control, ABS, electronic brake force distribution and brake assist come standard. The model we had came equipped with a number of pre-collision sensors as well. Exterior Design & Styling The exterior of the RAV4 is modern and sporty, though we thought the front end of the vehicle was kind of ugly. The front fascia of the RAV4 looks like someone gave it a fat lip via a well-placed uppercut. Otherwise, it's reasonably attractive and at least manages to set itself apart from some of its competition with interesting headlights and grille shape. 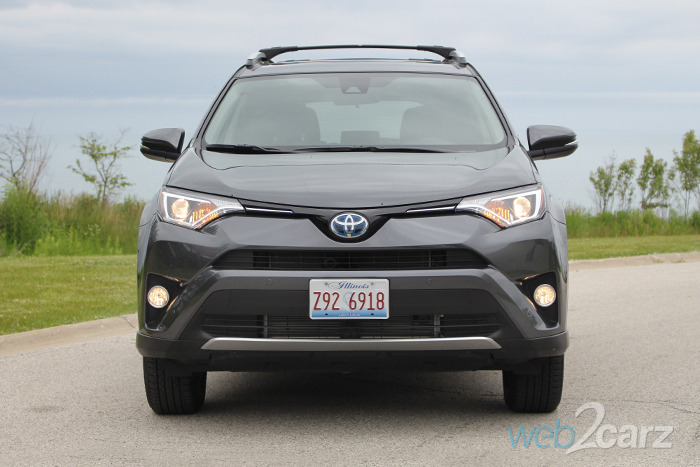 Front: The front of the RAV4 is interesting with a horizontally split grille and smaller but aggressive front headlights. Rear: The rear is much more subdued that the front, but it still had a focus on horizontal lines. 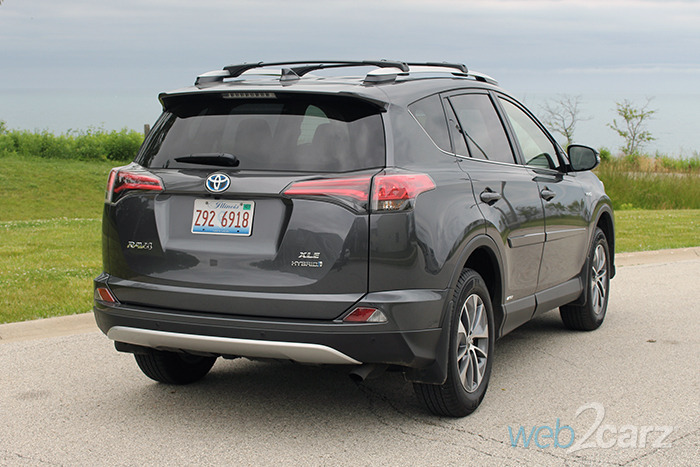 Profile: The RAV4 appears shorter and more compact in profile than it feels thanks to short overhangs on both the front and rear of the vehicle. Driver & Passenger Comfort The RAV4 places the driver in just about the perfect spot for a CUV. It's just high enough to see well, but not so high that you feel like you're in a stilted pickup truck. Driving it, you still feel like you're in a compact vehicle without it being too small or cramped. 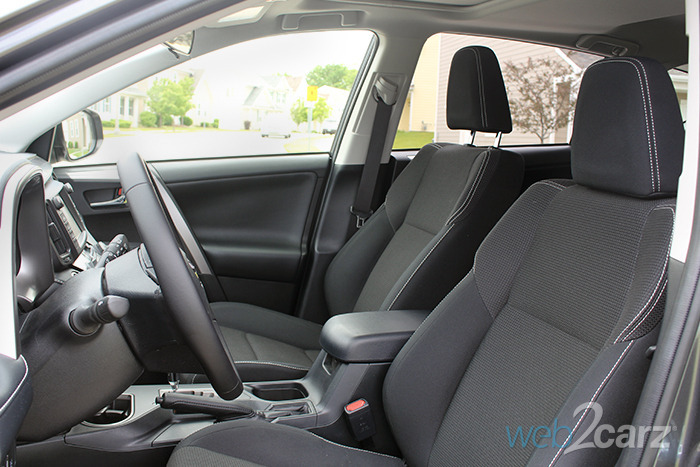 While the seating position is right and plenty spacious, the interior still feels a little off ergonomically. The controls for the tech are all in the right place, but the cup holders and storage spaces feel mildly out of reach in most situations. Also, the dash isn't exactly pretty. There're too many layers and edges, making for a visually busy surface. Front Seats: The front seats are supportive and well bolstered, and the material on the cloth seats in the model we drive was soft, yet still felt strong and tough. Rear Seats: The rear seats were also supportive and featured plenty of leg room for adults of average height, though larger people will feel a bit cramped. Visibility: Front, rear and side visibility are good, with well-placed pillars throughout the vehicle that aren't too thick. Storage & Cargo Room The RAV4 has plenty of storage room: a spacious center console, generous door pockets, a nice little cubby for your phone and a reasonably spacious glovebox, but as we stated above, some of those spaces are in weird places. The whole center stack and console feel like an afterthought. 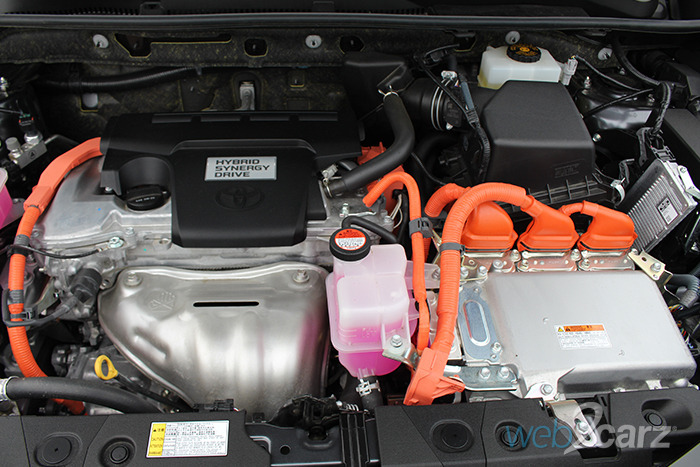 The cargo room of the RAV4 Hybrid isn't much different than the regular RAV4. Most of the time hybrids lack quite a bit of the cargo area of their non-hybrid brethren, but the RAV4 only loses about three cubic feet of cargo space, meaning you still have plenty of room for your stuff. 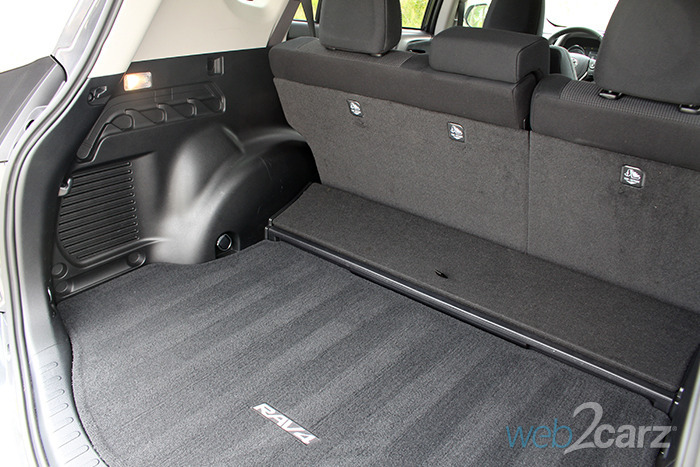 Storage: There are plenty of storage areas in the RAV4 Hybrid, but some of them feel oddly placed. The cup holders are spread apart, the space for your phone is too far forward and the center space beneath the armrest can be difficult to reach while moving. Trunk/Cargo Room: The RAV4 Hybrid boasts 36 cubic feet of cargo space with the seats up and 71 with them folded. 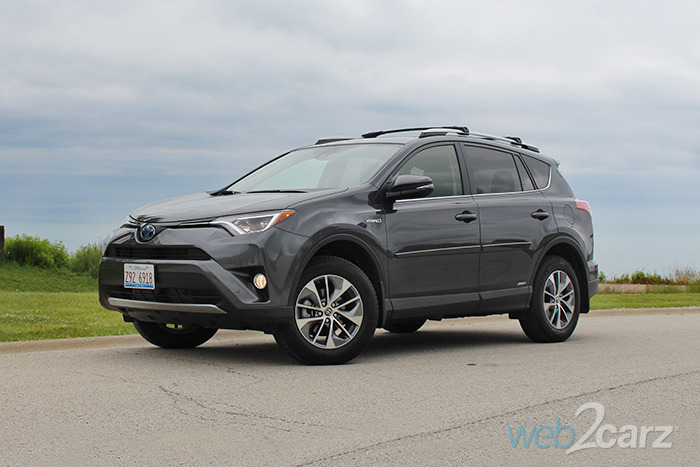 Final Impressions The RAV4 Hybrid is a spacious, comfortable, efficient CUV that's easy to drive and pretty good at just about everything most drivers need to do. If you've got some serious off-roading to do or some cross country driving, there are much better vehicles out there. Also, if it's excitement you're after, look elsewhere. This thing isn't sporty or fun to drive. As far as a solid everyday driver and occasional weekend trip vehicle goes, it's hard to find something that's better than the RAV4 Hybrid. The model we drove had quite a bit of optional equipment on it and still had a price tag of about $33K, which is several thousand below the average price for a vehicle in 2016. Considering that you're getting a hybrid powertrain and a heck of a nice vehicle overall, it really is a good deal.